There are many stories about men and women saving elephants. But here is a story about elephants saving a man. And then Gallucci stumbled onto an opportunity that forever changed his life. As a teen in 1975, he got a job as a welder on a movie, building fences to contain various wild cats — such as lions, leopards, and tigers — and two African elephants. As the trailer claimed, ”No animals were harmed during the making of 'Roar.' But 70 members of the cast and crew were." 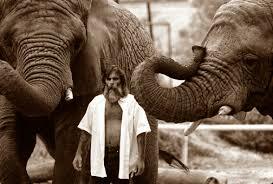 But for Gallucci, the experience was the beginning of a lifelong friendship with Timbo and Kura, the two elephants from the film. The first thing Gallucci tried to do was win the animals’ trust. For starters, Timbo and Kura were on tight chains. Gallucci gradually extended the lengths of their chains, so that soon they were able to walk relatively freely on the set property. That eventually led to deep bonding between Gallucci and Timbo. After filming wrapped for “Roar” — and the chaotic production took years to complete, as the film was not released until 1981 — Hedren converted this ranch north of Los Angeles into an animal park, which she named the “Shambala Preserve.” Shambala became the centerpiece of her Roar Foundation, which also took in other rescued cats.